Each sail is two hours long and generally includes an oyster dredging demonstration. Sails are unique depending on wind, weather, captain and crew. Advance reservations are recommended and accepted ONLINE, until midnight of the day before the sail. We carry up to 20 passengers per trip and the boat leaves the dock promptly on schedule. Call 410-228-7141 before 11am. We'll let you know of any remaining spaces. You can pay at the dock by cash or check only. Sails are subject to cancellation due to weather and unforeseen conditions. 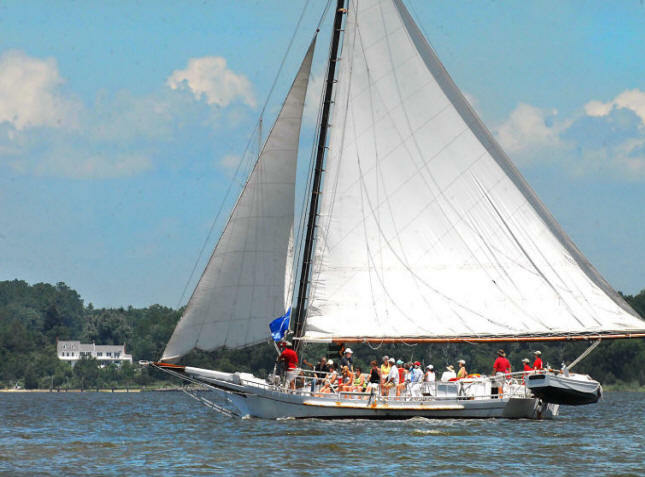 A full refund will be made if the sail is canceled by the Dorchester Skipjack Committee due to weather or other circumstances. You may cancel your reservations for refund up to three days in advance of sailing date. A credit for the amount of your payment, less a $5 processing fee, will be issued to your credit card. No refunds will be issued for reservations canceled less than three days prior to sailing date. We offer several special sails during our sailing season. Celebrate with that special someone while enjoying a spectacular sunset on the Choptank River. Light fare and non-alcoholic beverages are included. You can also bring along your own alcoholic beverages. Limited availability – $75.00 per person. Click on any of the links to book passage on a special sailing adventure! Seats go fast! Book early for these special sunset sails! 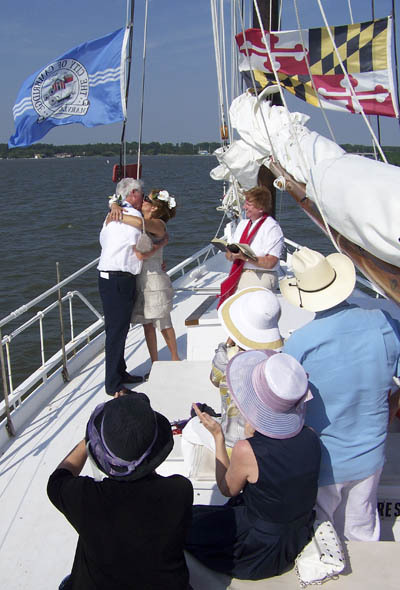 Make that special celebration even more memorable with a sail aboard a traditional Chesapeake Bay skipjack. Groups of up to 20 may charter the Nathan for any occasion, seven days a week, from late April through early November. Bring your own food and beverages to make the event even more enjoyable. We can provide a trained docent at no extra charge to add an educational dimension to your excursion. Ordained ministers can be arranged for onboard weddings. More information on sailing with us can be found on our Frequently Asked Questions page. Educational trips for school groups and team-building sails for business groups are also available. Our basic charter rate is $700 for a two-hour sail departing from Long Wharf in Cambridge. Contact us for rates for longer or shorter trips, departures from other locations and for additional services.